About every two weeks or so I get a call from a person who is looking for an “incense” called “K2”, or “Spice”. This is a mixture of herbal and spice plant products – the K2 package says it contains a “proprietary mixture” of Canavalia rosea (aka “bay bean”), Clematis vitalba (aka “old man’s beard”), Nelumbo nucifera (aka “sacred lotus”), and Ledum palustre (aka Rhododendron tomentosum or “wild rosemary”) – but it is sprayed with a variety of chemicals, including various different non-food-grade dyes (in fact, the packages are marked “Not for human consumption”), and the synthetic JWH-018 (naphthalen-1-yl-(1-pentylindol-3-yl)methanone, C24H23NO), JWH-073 (naphthalen-1-yl-(1-butylindol-3-yl)methanone, C23H21NO), HU-210 (1,1-dimethylheptyl- 11-hydroxytetrahydrocannabinol), or other similar substances, which are cannabinoid-receptor agonists in the human brain. Professor John W. Huffman, who first synthesised many of the cannabinoids used in synthetic cannabis, is quoted as saying, “People who use it are idiots” and “You don’t know what it’s going to do to you.” Here is a more complete list of JWH cannabanoids. It is also, very likely, contaminated with unknown toxic substances. These toxic chemicals are neither natural nor safe. More information about it’s precise makeup can be found at Erowid, Chemistry World and Wikipedia. I want to make it very clear that I do not sell “incense” that was intended for any use other than to be a fragrance, and when it comes to K2, my preference would be for you to go out and buy legitimate, if illegal, cannabis rather than bothering me – and, no, I don’t know where you can find either legitimate cannabis or it’s erzatz acquaintance. Let me Google that for you™, okay? K2 is just like drinks made with methanol during prohibition: Yes, it is apparently legal, despite concerted efforts to ban its consituent ingredients, and, yes, it will probably get you high, but it will also do a whole bunch of other, less pleasant things to you, and it might go so far as to kill you. Despite it’s illegal status (at the moment), legitimate cannabis has never killed anyone. If you don’t like the way things are, VOTE! And if you don’t think it makes a difference, then you likely haven’t read things like Toxicologist Warning to Parents: Look for Signs of K2 – ‘Fake Marjuana’ and After Indianola teen’s suicide, Iowa officials set sights on banning K2 and American Association Of Poison Control Centers: Fake Marijuana Spurs More Than 750 Calls To U.S. Poison Centers This Year Alone and Warning: Sweaty, Disagreeable Teenagers Might Be High on Drugs. 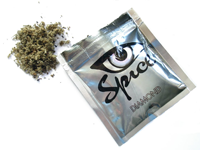 UPDATE: DEA Moves to Emergency Control Synthetic Marijuana and Legislation to Ban K2/Spice, “Bath Salts” and Other Synthetic Drugs Sailing Through Congress Today and ‘Spice’ makers alter recipes to sidestep state laws banning synthetic marijuana – so regardless of what the sellers want to make you believe, if you’re caught with K2 or Spice, you’re going to be arrested, whether the ‘Spice’ you’re carrying is illegal or not, just as if you were carrying cannabis. Prohibition doesn’t work. The way to change this is to vote to change the laws on a federal level.